Google is adding more options to the right-click context menu in Gmail. 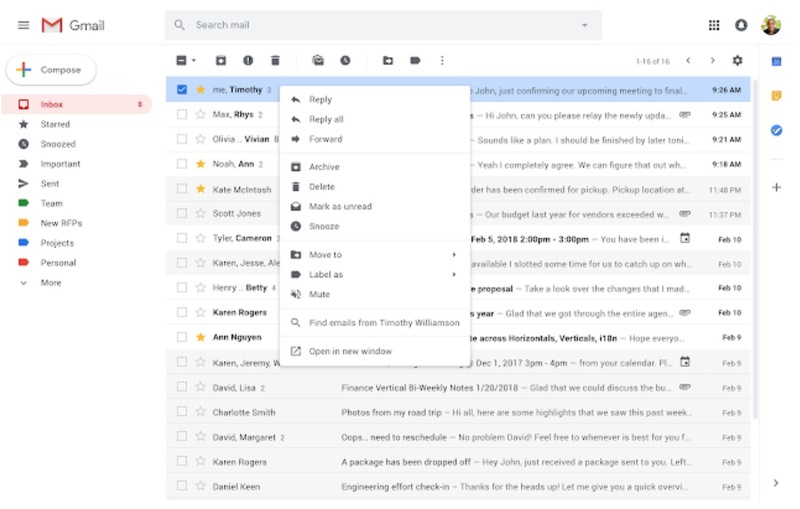 Gmail has had a right-click context menu for a while, but there were just options for archiving an email, deleting an email, or marking it as read or unread. Specifically, the right-click context menu can be opened by right click on PCs, ctrl+click on Mac Keyboards, and the menu key on keyboards. And the feature will be turned on by default. However, you may encounter some issues while trying to use this feature. When I tested the right-click context menu on my computer, I had mixed results. For example, the right-click context menu worked on Google Chrome but did not work on Safari on my Mac. Going forward, you will be able to reply, forward, snooze, mute, search from a sender, search for the same subject (if conversation view is off), open multiple emails in multiple windows at the same time, move an email, and add labels. These features will be rolling out to G Suite users for those on the rapid release schedule. And then it will arrive on February 22nd for users on slower scheduled releases. It is unclear when free Gmail users will see these features. There is speculation that it will be rolled out at the end of this month or in several weeks. If you want to handle some of these actions without right-clicking, then you can do so with hover actions. Under Settings > General of Gmail, hover actions can be enabled or disabled. This feature allows you to quickly gain access to actions like archive, delete, mark as read, and snooze controls on hover.